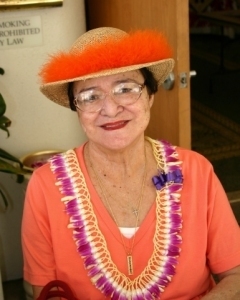 About Us - Hawaiian Quilting With Poakalani & Co.
Althea POAKALANI Serrao – (January 18, 1935 – Febuary 2, 2012) was born with only one hand and raised by her grandmother Caroline Correa. Tutu Correa a master quilter in her time held many quilting circles in her home on School Street and frequently visited family on Hawaii and Maui island sharing and designing Hawaiian quilt patterns. After watching her grandmother in her quilting circles Poakalani wanted to learn but her grandmother would not allow it thinking that she would hurt herself with the needles. It was not until 1972 four years after her grandmother had passed away and Poakalani had a family of her own that she was finally able to look into the larger quilt patterns she inherited from her grandmother. Her hope was to start her own quilt remembering the lessons her grandmother taught. Poakalani and her husband John Serrao viewed the quilt patterns and believed it would be easier to learn on a smaller quilt section than on a larger full size quilt. So they decided to create smaller cushion patterns conforming to the traditional and cultural aspects of old Hawaii. In 1972 John Serrao created the first 30 cushion patterns in her collection. Poakalani than began to sew and found to her greatest pleasure that even with only one hand she could do what others did with no discomfort; applique and quilt with the skill of an accomplished quilter. Over the next 35 years Poakalani and John would conduct workshops, seminars, quilt exhibitions not only locally but nationally and internationally. Poakalani became instrumental in helping countless others in trying their hand at quilting at a time when the art appeared to be falling aside. Poakalani expressed her feeling about teaching the art of the Hawaiian quilting, stating that the art should be taught to all who were interested whether they were Hawaiian or at least Hawaiian at heart. John Serrao was raised watching his mother, grandmother and great-grandmother applique, quilt and even design Hawaiian quilts but it was of no significance in his life until 1972 after his wife Poakalani showed and interest in Hawaiian quilting. Inspired by the quilt patterns his wife inherited John designed the first 30 Hawaiian cushion in their collection. While Poakalani quilted and ran their small pattern business John was busy working full time for the Honolulu Police Department. In 1988 John retired and started helping Poakalani full time in her quilting classes, while their quilting students often used their cushion patterns and the larger inherited commercial patterns they wanted their very own Hawaiian quilt design. One day they asked John to make a a full size quilt pattern and he told them that he only designed the smaller cushion patterns. They encouraged him to pick up a pencil and design his first large full size quilt. The rest you could say is history. John has become and is known today as Hawaii’s top quilt designer. He has designed well over 1000 quilt designs. His designs can be seen not only locally but worldwide. 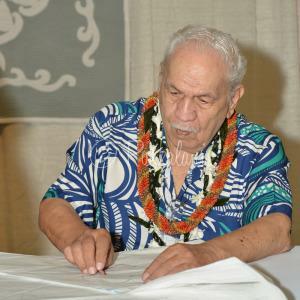 He has also become a Hawaiian quilt consultant, historian and cultural artist. John Serrao’s designs are not only based on the floral, culture and history of the Hawaiian quilts but also the spiritual essence of the quilter themselves.